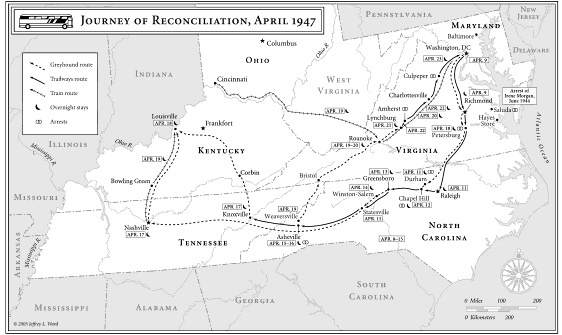 1947 -- The Journey of Reconciliation was the first interracial Freedom Ride. Its goal was to raise awareness for enforcement of the U.S. Supreme Court's 1946 Morgan v. Virginia decision that banned racial segregation in interstate travel. 1909 -- After President Taft met with Congress to discuss reducing tariffs, making good on a campaign promise, the Payne bill was passed by the House. It was soon substituted with the Aldrich Act, which increased tariffs. The consequences hit the publishing industry particularly hard. 1867 -- "Seward's Folly" purchased Alaska from Russia for $7.2 million ($119 million in 2014 dollars). The official transfer was made October 18. 1865 -- Robert E. Lee surrenders at Appomattox Courthouse in Virginia, ending the Civil War.